On most nights and days, the Moon is visible somewhere in the sky. For many, simply noticing it is a pleasure, yet it is also a fascinating world of craters, mountains, and volcanoes worthy of a closer look. The 21st Century Atlas of the Moon is uniquely designed for the backyard, amateur astronomer. As an indispensable guide to telescopic moon observation, it can be used at the telescope or as a desk reference. It is both accessible to the novice and valuable to the expert. With over two hundred Lunar Reconnaissance Orbiter images, the highest quality images of the moon ever taken, this atlas illustrates the Moon in high resolution. The Atlas clearly provides unprecedented detail on more than one thousand named Moon features, while recommending additional features and images to observe. 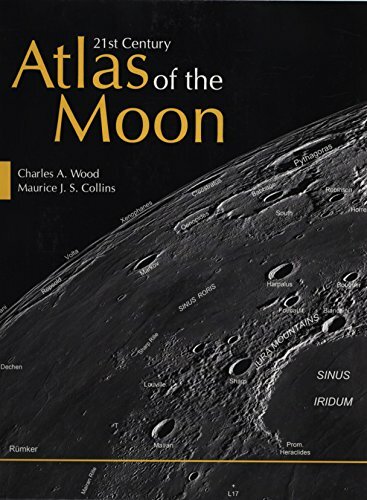 With special maps of the limb and far side, LRO altimetry-based images of major basins and their mare ridge, and maps of the Apollo and Soviet landing sites, this guide offers a level of detail never before seen in an atlas of the Moon. Wood, Charles A.; Collins, Maurice J. S.
Wood, Charles A./ Collins, Maurice J. S.